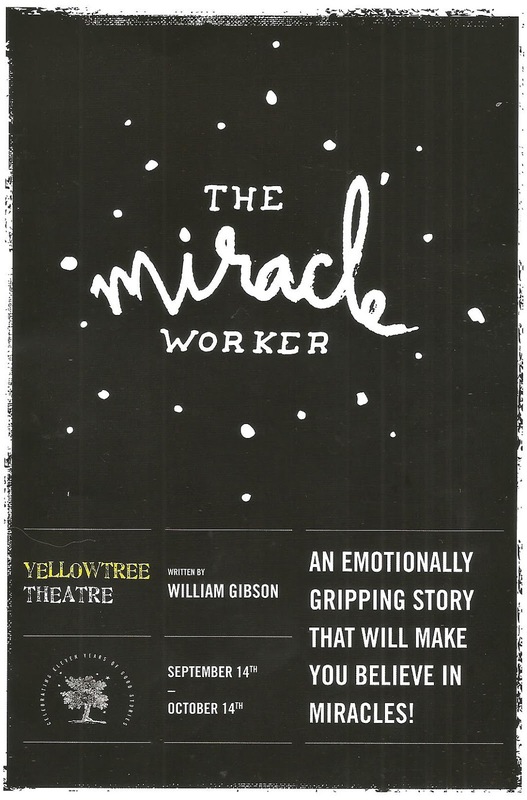 Yellow Tree Theatre opens their 11th season in their cozy little space in a strip mall in suburban Osseo with an inspirational true story about two remarkable women. We all know the story of the first deaf-blind person to earn a college degree, Helen Keller, and her teacher Anne Sullivan, an orphan with vision problems of her own. But seeing The Miracle Worker on stage brings this story to life in a way that books or movies cannot, and Yellow Tree's beautiful staging in their intimate space is moving and immediate. 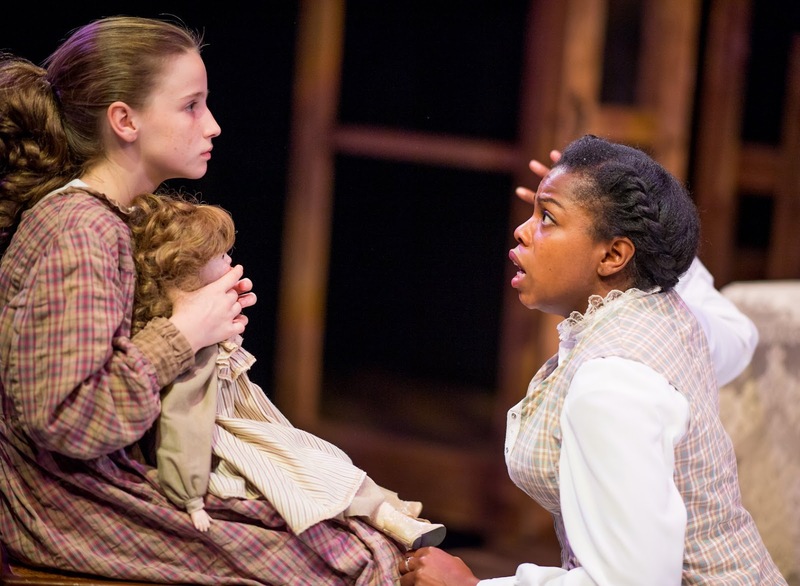 After a brief scene of Helen recovering from an illness in infancy that left her blind and deaf, the play focuses on a two week period when Annie was first hired to teach Helen when she was about seven, and Annie only 21. Up until that point, Helen's family indulged her and cared for her but didn't have the skills to teach her, or even know if she could be taught. Helen's mother loved her fiercely and never gave up hope, her father was mostly hands off as fathers of that era were, her older half-brother felt neglected, and Aunt Ev did her best to keep the family together. Annie came into the family with tough love, treating Helen just like any other child and insisting she display manners and do her lessons. She saw what the others didn't, that Helen was hungering for words and knowledge and just needed the key into that world. She expected that Helen could learn, and she did. It's amazing what people can do when you believe in them. The iconic moment at the water pump when Helen finally realizes what words are is so profound it'll give you chills and bring home the importance of language and learning in everyone's life. The play ends shortly after that scene and I wasn't ready for it, I wanted to see more of Helen's incredible journey. 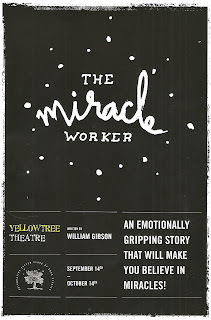 This is a really wonderful cast, several of whom are new to the Yellow Tree stage. Starting with young Catie Bair as Helen, who says so much with no words. With her brown hair and freckles she looks the part (which in my mind is Melissa Gilbert, having grown up with the 1979 TV movie version), and perfectly projects that defiant yet eager attitude of the girl who wants to learn. Kiara Jackson is a fantastic Annie, smart and tough and slightly awkward as she navigates this new situation (and kudos to Yellow Tree for the color conscious casting). This is really Helen and Annie's story, and these two make a great team, with some impressive and well choreographed physical scenes (fight choreography by Corey Mills, with Patrick Coyle directing the well paced and staged show). The strong supporting cast includes Jane Froiland and Casey E. Lewis as Helen's parents, Lukas Levin as her brother, Melinda Kordich as Aunt Ev, Aaron Goehle as the adorably patient neighbor boy, and Matt Wall as various characters. Even if you know the story, there's something new to learn and experience from seeing it on stage. 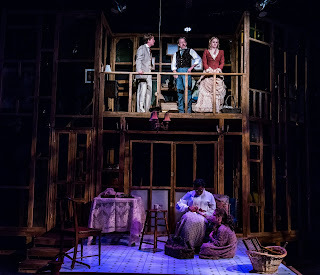 It's a beautiful story of connection, family, teaching, learning, language, and love, well staged at my favorite little theater in the 'burbs. Continuing through October 14. Limited tickets remain so act fast!